Sig Pfeifer, who emigrated from Germany at age 12, believes understanding is key to human rights. He is chair of the Paynesville Human Rights Commission, which is sponsoring the Festival of Ethnic Traditions this Sunday. Sig Pfeifer has known poverty, known hunger, and known racism, which is why he thinks human rights are so important. As a German emigre to Michigan in the 1950s, he was taunted at school and saw his father teased for his broken English, but Pfeifer holds no grudges. He sees that the behavior was just the result of cultural misunderstandings and of anti-German feeling following WWII. "As a kid, that hurt. I think it hurt my parents. That kind of set in my mind that I would have something to do with human rights," said Pfeifer, of the taunting he received as a kid. Others, he stressed, had it far worse. Pfeifer, born in Silesia in 1942, was a German refugee from the advancing Red Army at the end of WWII with his grandmother, mother, and sister. His father, who was drafted into the Wehrmacht and fought on the eastern and western fronts, was listed as missing in action after the war. But, unknown to his family, his father was released from an Allied prisoner of war camp, found a job as a baker, despite losing an eye, and spent his free time making fliers to search for his family. Sig Pfeifer, chair of the Paynesville Human Rights Commission, has wanted to work on human rights and cultural understanding since emigrating from Germany as a kid in the 1950s. A flier eventually made its way into the camp where Sig, his mother, his sister, and his grandmother were living, and the family was reunited. They emigrated to Michigan in 1953, when Sig was 12. Sig, who spent 25 years in the U.S. military and taught for 32 years at Litchfield High School, sees himself as an American first and a German second. As a German teacher, his primary job was to teach students a foreign language, but he always saw that complimented by teaching cultural understanding and empathy. Pfeifer had his students translate Beatles songs from German to English, which not only improved their language skills but it taught them that the popular music group lived in Germany, sang in German, and that their music was also popular with Germans. His students also watched movies in German, played games in German, sang in German, ate ethnic foods, and made gingerbread houses as an annual fundraiser. Pfeifer holds no grudges against people who teased him because he feels it was caused by misunderstanding. "People make assumptions without knowing the whole story, and it's a mistake,"�he explained. "We all do it, and we need to be careful." Improving the cultural understanding of his students went beyond the classroom for Pfeifer. "That's the reason, I took them overseas, not to see castles," he said. Sure, they went sightseeing during the 20 or so student trips he led back to Germany, but the real purpose was to have them experience a different culture, which is why the students always had a seven-day homestay. And he always took students to the concentration camp at Dachau, because "they need to know." 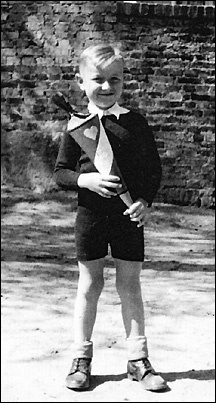 Sig Pfeifer posed for a picture before heading to his first day of first grade in Sachhausen, Germany, in the 1940s. 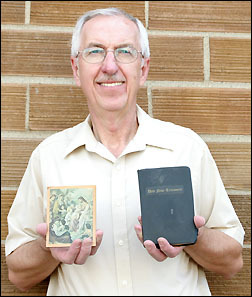 His family emigrated to Michigan in 1953. And, in experiencing a different culture, students frequently gain a perspective on the freedoms that America offers. Everytime he goes back to Germany, said Pfeifer, he is glad to come back home to the United States. "I've been here many years, and I'm an American," he said. "We have a freedom that other people just don't have." Pfeifer also served as coordinator for Youth for Understanding, an exchange program, for ten years while teaching in Litchfield and takes pride in hearing from former students who are living or working overseas. The more cultural understanding is shared, the more barriers will be broken down, he feels. Pfeifer has been a member of the Lions Club in Paynesville since 1995, when he and his wife Pam - who has taught at PAES since 1989 - moved to town. He is now chairman of the Paynesville Human Rights Commission, which sponsors the ethnic festival, in his third year on the commission. The Festival of Ethnic Traditions -�which will be held on Sunday, Aug. 7, from 12:30 to 5 p.m. at the athletic fields at Paynesville Area High School - is a fun way to introduce people to the music, dances, and foods of other cultures, said Pfeifer. "It's a start (at cultural understanding)," he explained. "And who knows, some youngster who is watching might be influenced by that. It could plant a seed somewhere down the line." The fifth annual Festival of Ethnic Traditions - sponsored by the Paynesville Human Rights Commission - will be held from 12 to 5 p.m. on Sunday, Aug. 7, at Paynesville Area High School. The Festival of Ethnic Traditions will also feature 13 vendors of ethnic foods as well as activities for kids. Some seating will be available, but people can bring their own lawn chairs or blankets to sit on the grass.